1. Always start your practice with heartfelt gratitude. Meditate (verb):To engage in contemplation or reflection, or mental exercise (as concentration on one’s breathing or repetition of a mantra) for the purpose of reaching a heightened level of spiritual awareness. Many people believe that meditation is hard to do and that one has to go to long retreats in order to learn the practice. Others believe that meditation takes so much practice it becomes available for the select few who have the luxury of time, and resources. There is a common misconception that one must be born with an innate predisposition for meditation. The only predisposition you need to have is the willingness to believe that it is available to you. I would like to bring awareness to the fact that taking a pause to let the mind rest, and meditate, is one of the greatest luxuries we can afford. And this luxury costs nothing at all — available to all of us anytime, anywhere. Meditation is the portal to the wisest, calmest, centered part of ourselves that is present all the time. Because of our complete identification with the outer world, constant connection to our activities, and super connectivity with our devices and our worldly self, we have completely disconnected from that calm place within. Our mind makes us believe it’s an uncharted territory. The easiest way to start meditating — and the way you can become a fruitful meditator — is to start with heartfelt gratitude. This practice of gratitude immediately connects us to our heart. We must bring our heart present in order to find that centered, wise place. Because in that place of a grateful heart, there is compassion, understanding, kindness and, yes, calm. Start by taking account of what you are grateful for, from the smallest to biggest things — even for the challenges you are facing. Offer thanks to the very essence of life (or whatever that is for you: God, the universe, the invisible, etc). Consider all the gifts and resources life has bestowed upon you — from your health and family to your self-awareness. As you become connected with that, start to turn your attention and focus inward. Never worry about emptying your mind. If your thoughts wander, let thoughts come in — and then let them pass by. Refocus your mind to what lifts you — and to your very breath. When we go beyond our thoughts and emotions, we start to realize that we are more than those thoughts and those feelings. It is extraordinary what happens as we observe the feelings that so grab us and have their way with us. They zap of us of our energy. It is a wonder what can happen when we observe these feelings and not identify with them. We start to experience our being. Consistently returning to your breath is the way to rise above our conditions, dissolve conflicts, and experience the magic of letting go. You can start building your inner sanctuary. In the underbelly of our hearts and our being lies vast connection to the very source of who we are. This all can sound Greek to you if you’ve never attempted to go there. But take it from a Greek who has been meditating for years, it is life-changing, life-enhancing — and the greatest secret to happiness, creativity, and calm. There is no better moment than now to partake in this most sacred gift that was given to us freely. In my new book Wake Up to the Joy of You, I expand on the gifts of meditation and I have recorded 32 guided meditations to help your shift to a calmer and more connected place. Here is a short one from Chapter 1: the Art of Meditation. I hope it will inspire you to give yourself a pause to replenish yourself. 1. Always start your practice with heartfelt Gratitude. Think of a place that you love that brings you calmness — and go there in your creative imagination. 2. Focus on your heart beat. This magical organ that pumps blood throughout your body and keeps you alive. And be deeply grateful for this miracle, and for every breath you take. 3. Observe the rising and the falling of your breath. Be in awe of your breath. Spend at least five minutes a day just focusing on the breath. 4. Imagine that each conscious breath is building a bridge to the You that is wise, calm, and centered — and knows you in your essence. 5. Suspend all judgements about your practice. There is no wrong way to meditate; It’s just you being at one with your self, wherever you find you. 6. Don’t try to control your mind. It is as impossible as trying to control a 500 pound gorilla. Let your thoughts and your feelings come. Observe them and let them go. Just don’t identify with them. If your mind is too agitated, keep a pen and notepad next to you and jot down the things that are bothering you. It is another way to release pent-up thoughts. And return to your practice. 7. Think of the awesome fact that you have 37.2 trillion cells in your body that are creating, re-generating, and keeping you alive in this moment. Just as you began your practice with gratitude, reconnect with that gratitude now. The operative term in the practice of meditation is just that: practice! AGAPI STASSINOPOULOS is a best-selling author and speaker who inspires audiences around the world. In her last book, Unbinding the Heart: A Dose of Greek Wisdom, Generosity, and Unconditional Love, she shares the wisdom she gained from her life’s adventures and experiences. In her new book, Wake Up to the Joy of You: 52 Meditations and Practices for a Calmer, Happier Life, she takes readers on a journey and inspires them to let go of what doesn’t work and instead create the lives they really want. Agapi was trained in London at the Royal Academy of Dramatic Art and then moved on to receive her master’s degree in psychology from the University of Santa Monica. Her previous books on the Greek archetypes, Gods and Goddesses in Love and Conversations with the Goddesses, were turned into PBS specials. She is currently conducting workshops for Thrive Global, a company founded by her sister, Arianna Huffington, to help change the way we work and live. She divides her time between New York and Los Angeles and was born and raised in Athens, Greece. 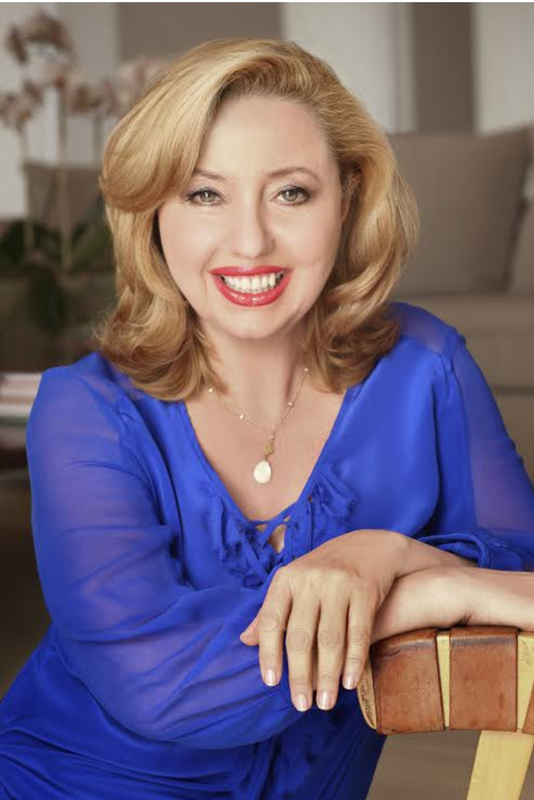 AGAPI STASSINOPOULOS is a best-selling author and speaker who inspires audiences around the world. In her previous book, Unbinding the Heart: A Dose of Greek Wisdom, Generosity, and Unconditional Love, she shares the wisdom from her life’s adventures and experiences. In her new book, Wake Up to the Joy of You: 52 Meditations and Practices for a Calmer, Happier Life, she takes readers on a journey and inspires them to let go of what doesn’t work and instead create the lives they really want. Agapi was trained in London at the Royal Academy of Dramatic Art and then moved on to receive her master’s degree in psychology from the University of Santa Monica. Her previous books on the Greek archetypes, Gods and Goddesses in Love and Conversations with the Goddesses, were turned into PBS specials. She is currently conducting workshops for Thrive Global, a company founded by her sister, Arianna Huffington, to help change the way we work and live. Agapi has spoken and conducted meditations at many organizations and companies including ABC Carpet & Home, Women’s Health Magazine, Museum of Modern Art, IBM Watson, SAP, Pandora Radio, CVS Corporate, Weight Watchers, PepsiCo, Google, Nike, Starbucks, Fortune Health Conference, and The Heart Association, amongst many. She divides her time between New York and Los Angeles and was born and raised in Athens, Greece. To Unplug or to Unravel?